When it comes to tiny insects, there is always going to be great difficulty observing or even noticing a problem. Especially when it comes down to insects that are too small to see, as the larvae of these beetles are, an infestation can become widespread before a person even realises it. And because both adult and larvae beetles come out to feed in the dark, their presence is very difficult to detect. With all of these factors preventing a homeowner from realising how bad their beetle infestation may be, the need for professional pest control increases dramatically over time. Typically, carpet beetles fall into two categories: the Fur Beetle (the Attagenus pellio species) and the Varied Carpet Beetle (the Anthrenus verbasci species). The Fur Beetle is also known as the two-spot carpet beetle because of that notable feature. The beetles are mainly observed damaging products like textiles, leathers and furs, as well as feeding off of dead chicks and feathers in bird nests. Indeed, beetles feed on many different types of animal by-products, including animal hair and wool. It is because of this appetite that they create such a large problem in the home: they feast on carpets, blankets, clothing, upholstery and many other animal-related products. These carnivorous beetles can enter the home through windows and doors, as well as through cracks and slits, and on flowers. They generally choose to nest inside of bird nests in order to provide an abundant source of food for their larvae, but they also lay their eggs inside of walls or chimneys where there are enough dead animals and insects to feed off of. Although adult carpet beetles can eat pollen and nectar in gardens and away from the home, the rich natural fibre in carpets attracts many of the larvae, as well as the adults, and can cause significant damage to the carpet. Both Fur Beetle and Varied Carpet Beetle larvae are known as ‘woolly bear’ and they are most widespread during spring, when they are attracted by light and are easily seen near windows. The hairy form of the larvae changes as the insect pupates and sheds its hairs. Another concern is raised by this process because if these hairs get stuck in human skin they can create a bite-like effect. 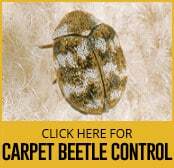 The Varied Carpet Beetle, in particular, has a lengthy lifetime and by the time they have transformed into adults, and have become regularly noticeable by the human eye, they will have been feasting on items in the home for as much as three years. It is because there is such a risk of having an unseen and widespread infestation that pest control services are sometimes a necessity. Our goal is to provide you with those services and to ensure that the right treatment is applied for the right circumstance. It may be as simple as removing bird nest materials around your home or as complicated as repeated application of insecticides on carpets and within the home. Whatever the approach needed, we aim to completely cure your beetle problems.